Through the focus on organizational space, using the reception and significance of the seminal work on the subject by sociologist Henri Lefebvre, this book demonstrates why and how Lefebvre's work can be used to inform and elaborate organisational studies, especially in view of the current interest in the "socio-material" dimension of organisations. As the "spatial turn" in organisational research exposed the importance of spatial design in inducing power and cultural relations, Lefebvre's perspective has become an inspiring, theoretical framework. However, Organisational Space and Beyond explores how Lefebvre’s work could be of a much wider relevance, especially given his profound theoretical engagement with diverse schools of philosophical and sociological thought, including Nietzsche, Marx, Sartre and Foucault. 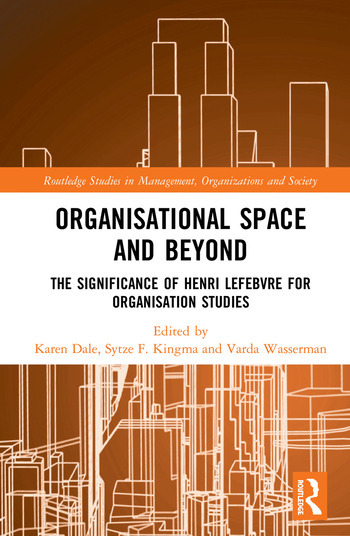 This book brings together a range of authors that collectively develop a broader understanding of Lefebvre's relevance to organizational studies, including areas of management concern such as strategy and diversity studies, and ultimately draw on Lefebvre’s work to rethink, reimagine and reshape scholarship in organisational studies. It will be of relevance to researchers, academics, students and organizational professionals in the fields of organisation studies, management studies, cultural studies, architecture and sociology. Karen Dale is a Senior Lecturer and Director of Teaching in the Department of Organization, Work and Technology at Lancaster University, UK. Sytze Kingma is a Senior Lecturer in the Department of Organization Sciences at Vrije Universiteit Amsterdam, Netherlands. Varda Wasserman is a Senior Lecturer in the Department of Management and Economics at the Open University of Israel, Israel.